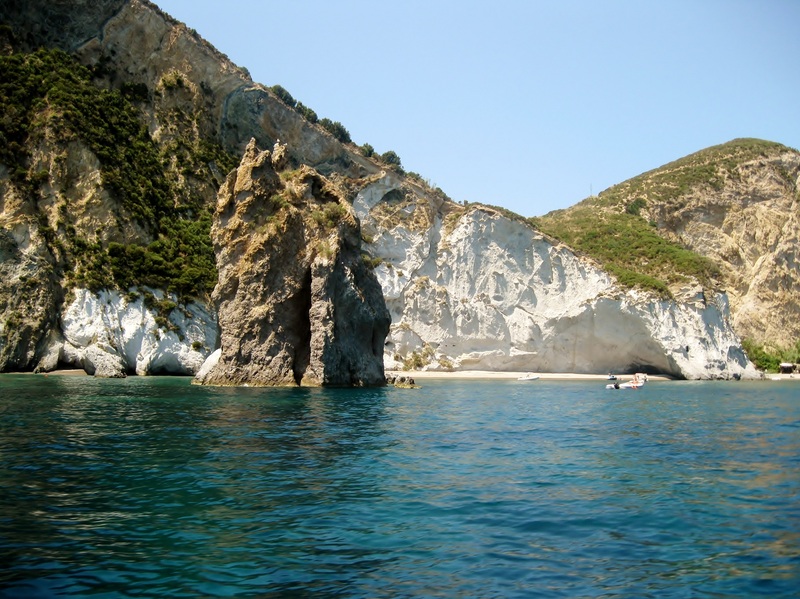 Since I met my husband back in late 2004, he always wanted to take me to Ponza. 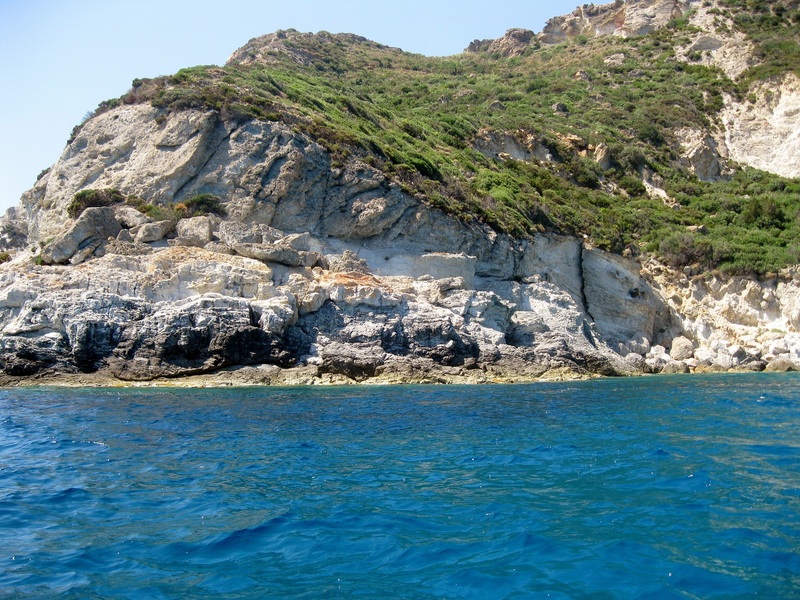 He used to tell me that if I went to this island, I would not believe that such an amazing place was just 70 miles away from Rome. 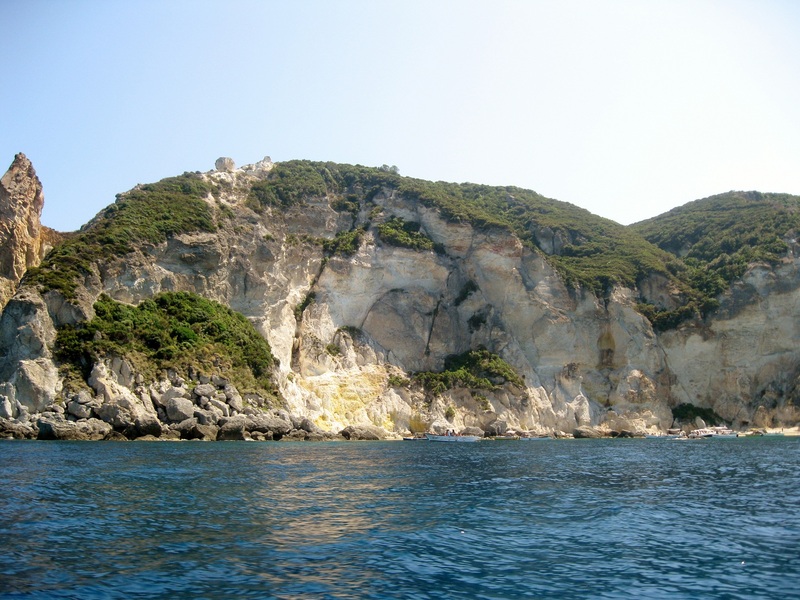 I always thought that in order to see beautiful Italian islands, I had to go all the way down to Amalfi Coast, Sardinia or Sicily. 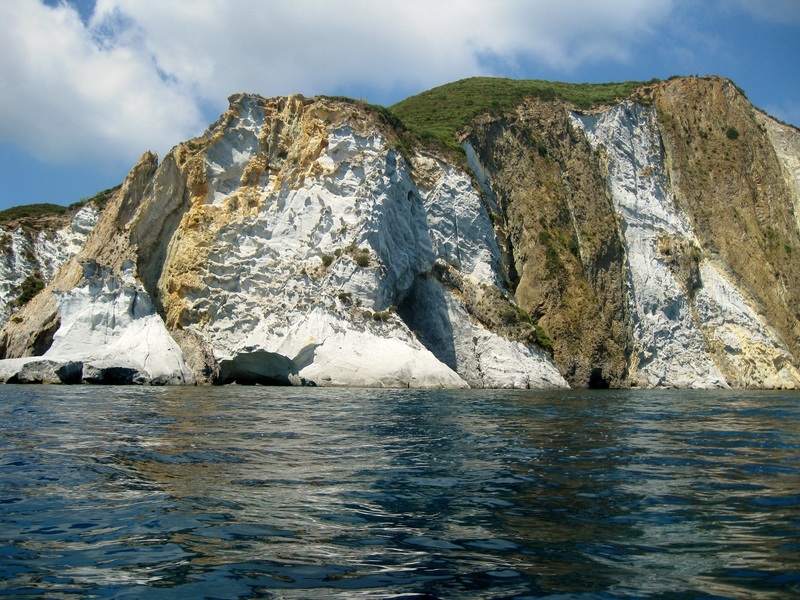 Located in the Tyrrhenian Sea off the west coast of Italy, Ponza is the largest of the “Isole Pontine” (Pontine Islands) archipelago. 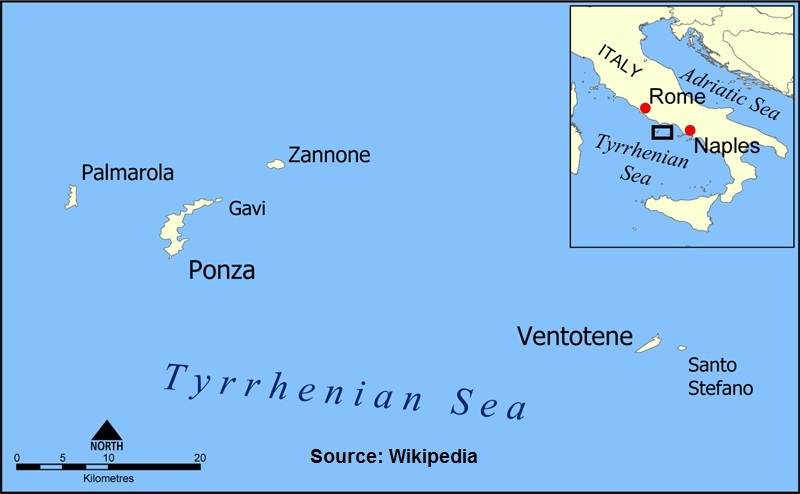 The other islands in the archipelago are Palmarola, Zannone, Gavi, Ventotene, and Santo Stefano. 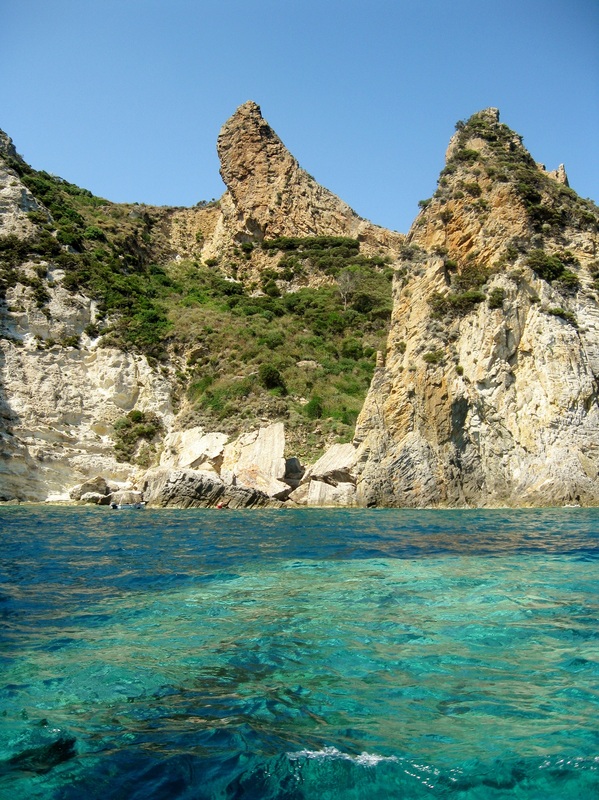 Ponza is within the Province of Latina- the southernmost area in the Lazio Region – that borders the Campania Region. 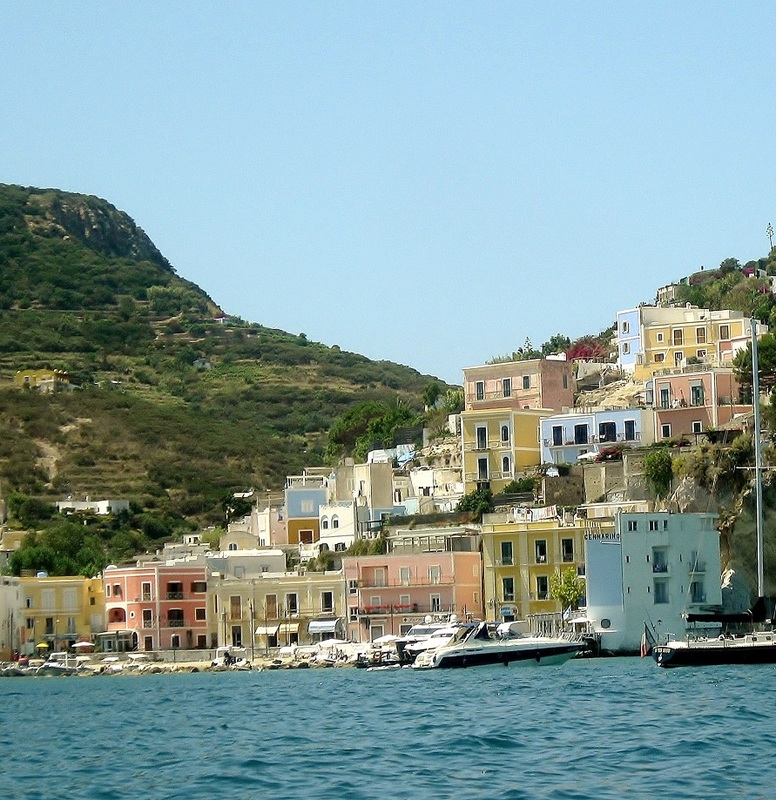 This bordering position “in between” these two regions gives Ponza a beautiful mixture of both Roman and Neapolitan cultures: you can see this in the slang, gastronomy, and lifestyle. 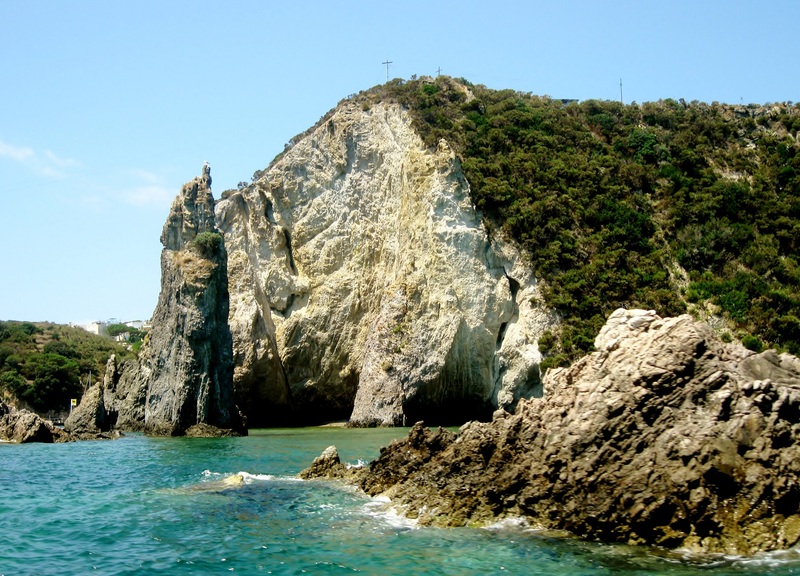 Ponza is the Romans getaway to relaxation (and I just needed it after a stressful week at work), but it is also a place to have fun and hang out with friends; not to mention that Ponza is a very romantic island, famous for its breathtaking sunsets, and beautiful secluded coves. So where do I start? What pictures should I take? When I arrived, I wanted to take all the pictures I could. My husband stared at me like if I was a nutty tourist who just came out of a cave. In fact, after the trip, when I downloaded all the pictures from the camera and saw their sequence, it seemed like an old slow movie made of a series of pictures!! He kept telling me: “Calm down, you’ll have enough time to walk around the island. 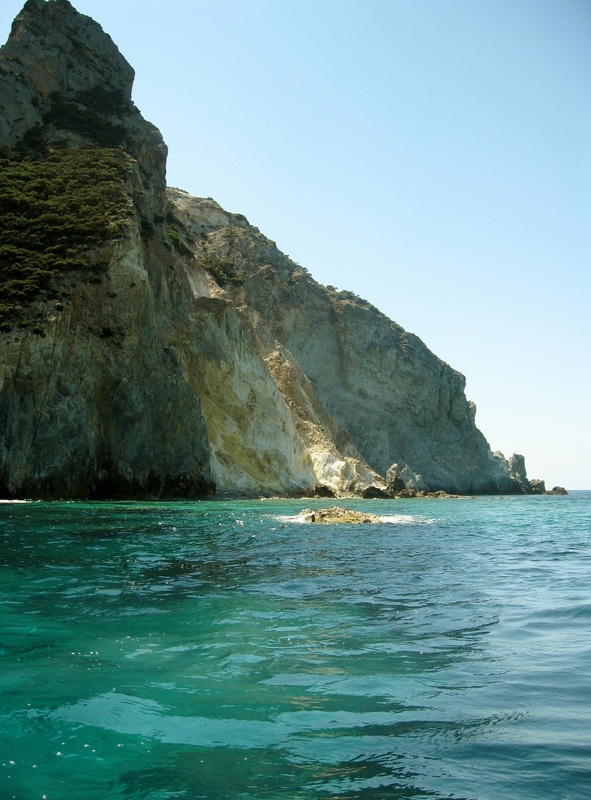 The first thing I want to do is show you Ponza’s stunning coves!” So off I go: out of the caves, into the coves! 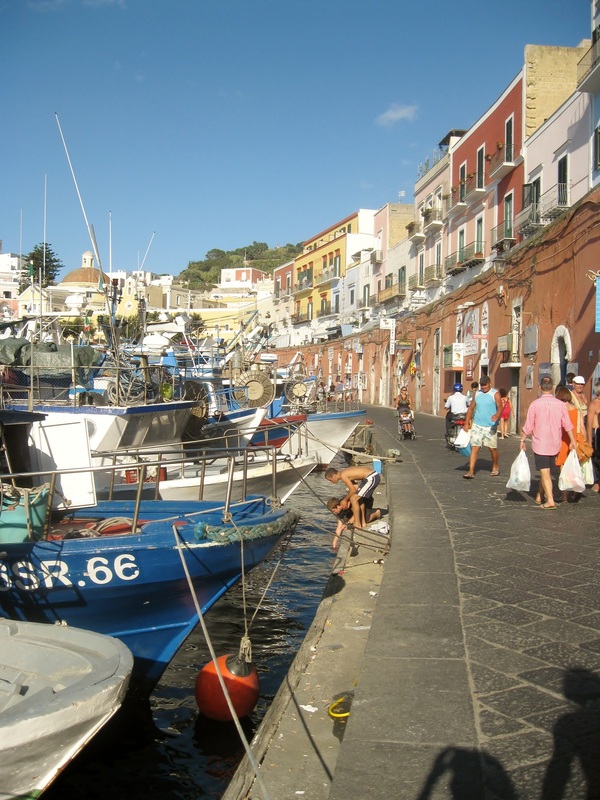 On our way to our Bed and Breakfast walking down Ponza’s main street. 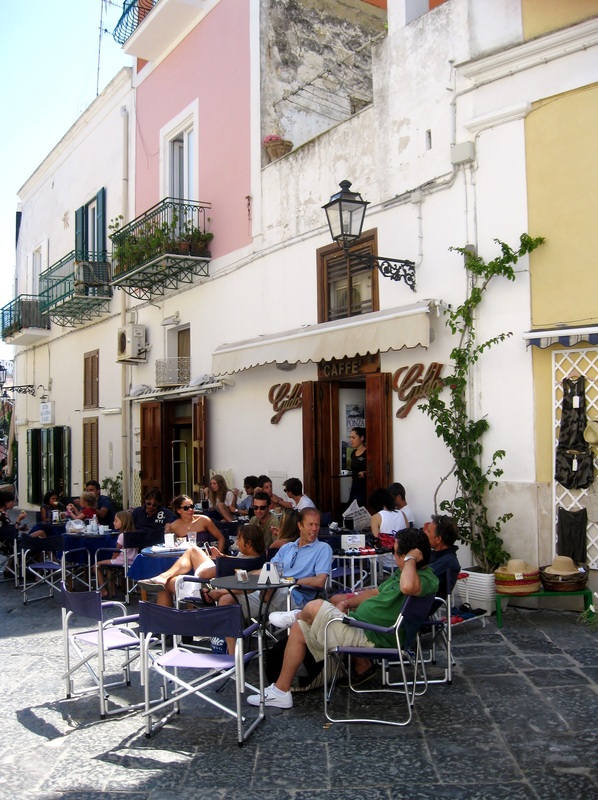 As we headed to our B&B, we came across some charming sidewalk cafes and bars where tourists (mostly domestic) were just hanging out and having some coffee or just getting some drinks before dinner. 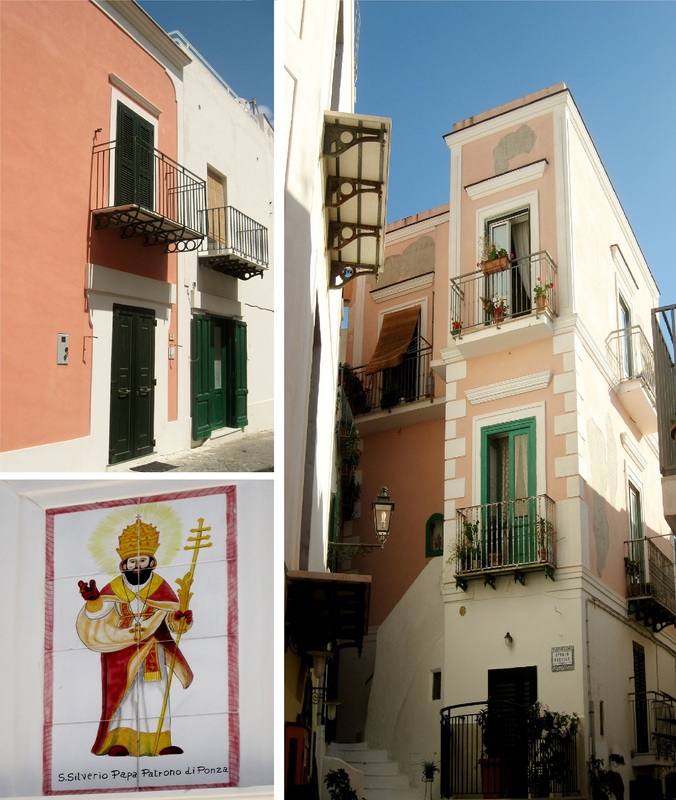 As you can see from these pictures, Ponza’s buildings are mostly painted in pastel colors. 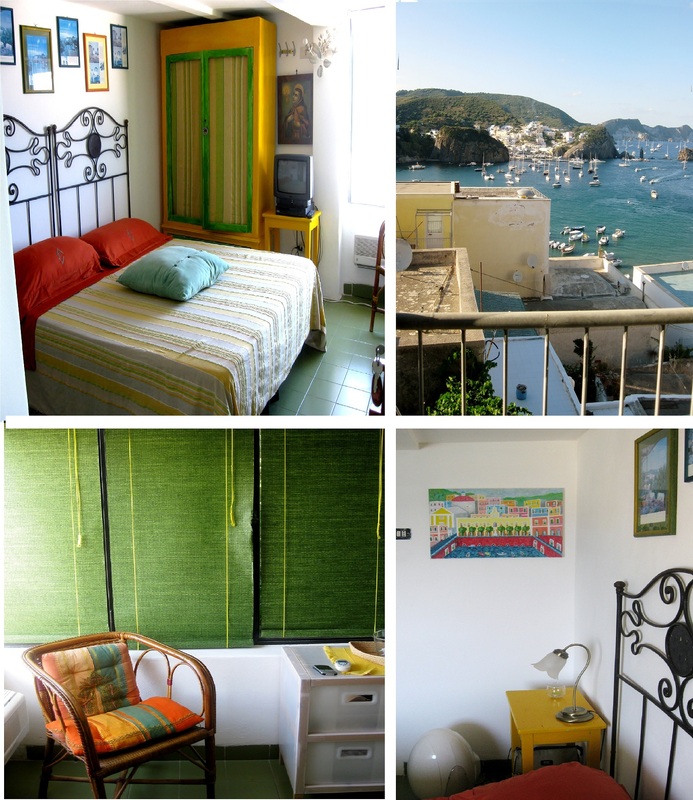 The picture on the bottom left is a portrait of San Silverio, the Patron of Ponza. No wonder why in this island every 2 out 0f 5 guys are named Silverio!!! 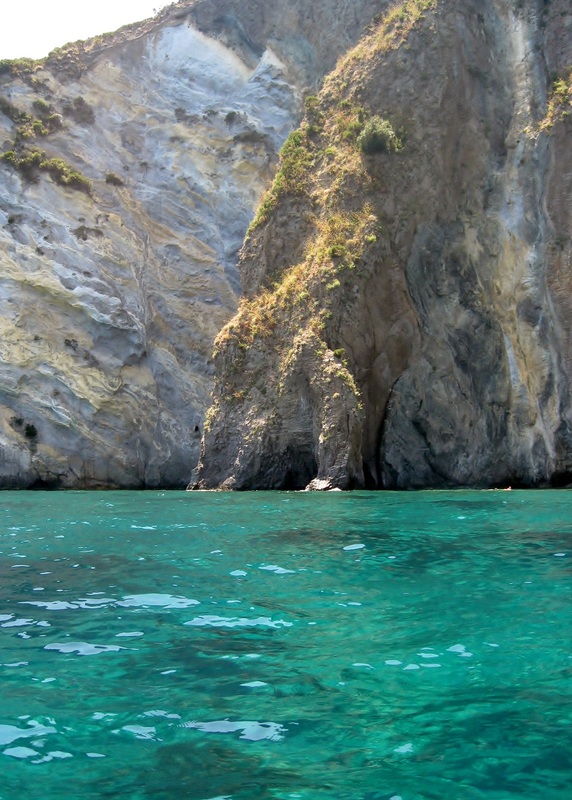 I was fascinated by the colors of Ponza. 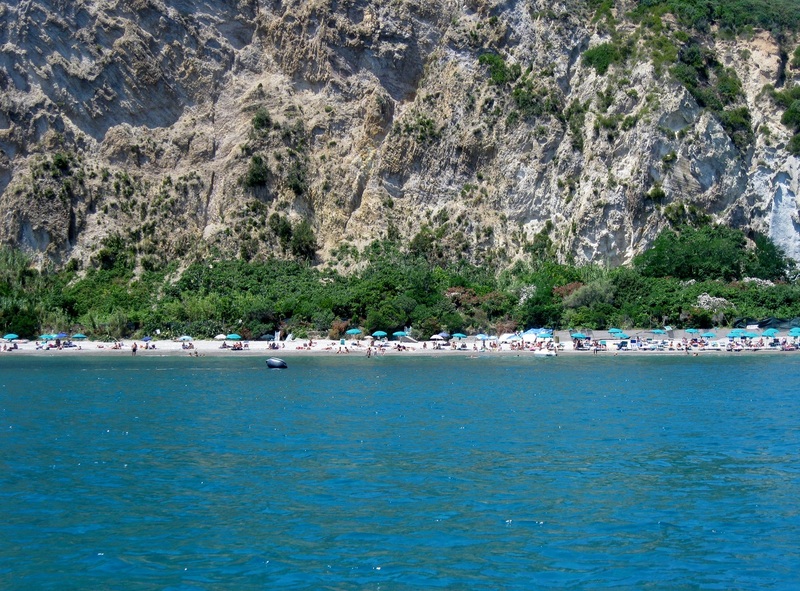 It reminded me of a less touristy Amalfi Coast. 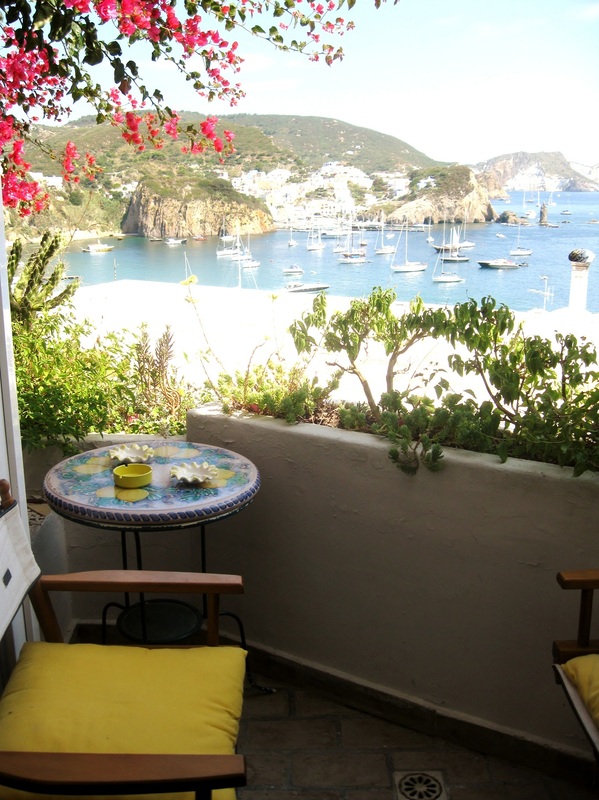 After going up all the stairs of Ponza, we finally arrived at La Limonaia (meaning Lemonary), our Bed and Breakfast (I guess it was worthwhile). After all, what is a Bed and Breakfast without it’s “breakfast area”? 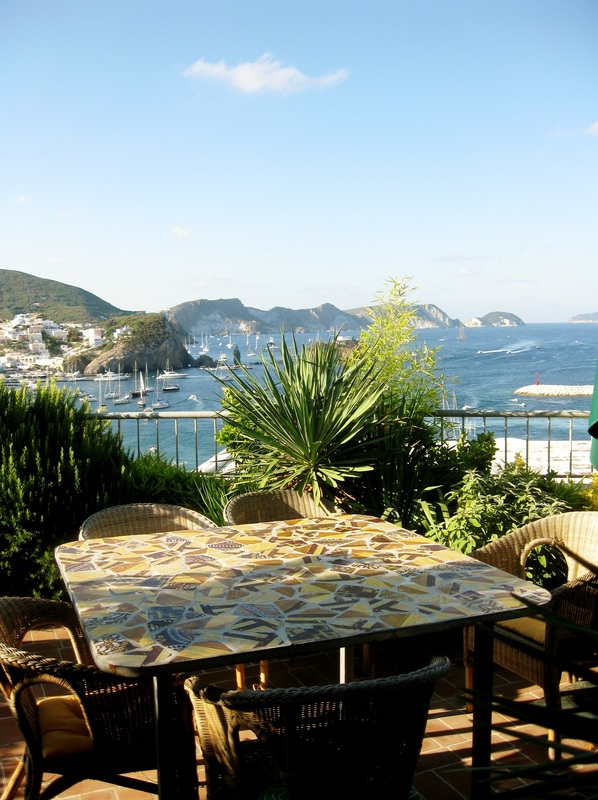 …and a breathtaking view of Ponza? Our tiny but cozy room. 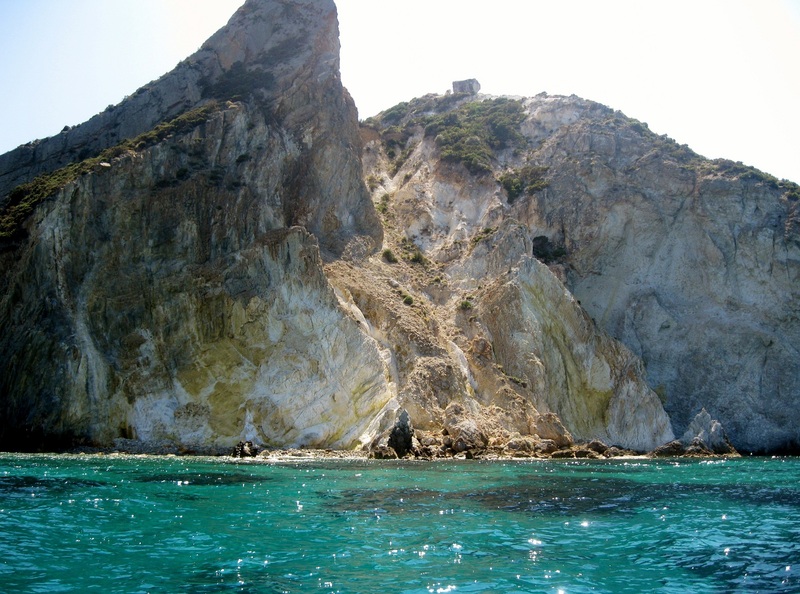 …and then we took a taxi boat to visit the most famous beach of Ponza, “Il Frontone”. 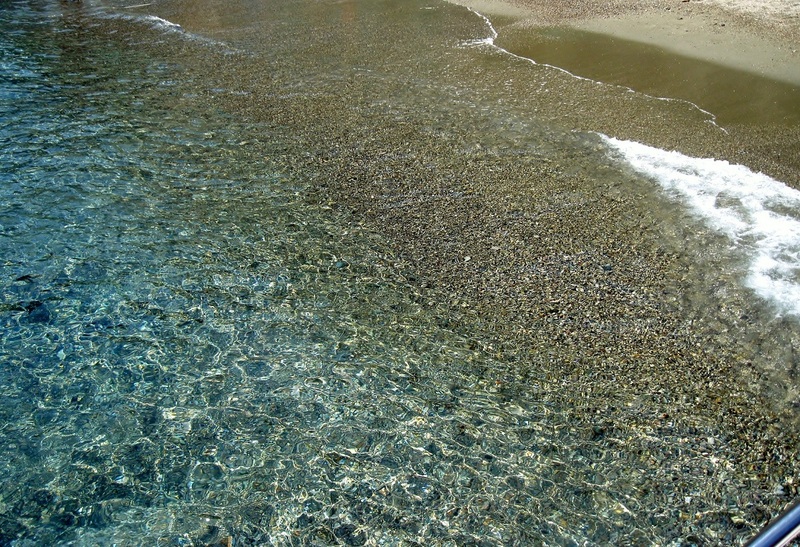 I was amazed at the crystal clear waters of the beach. 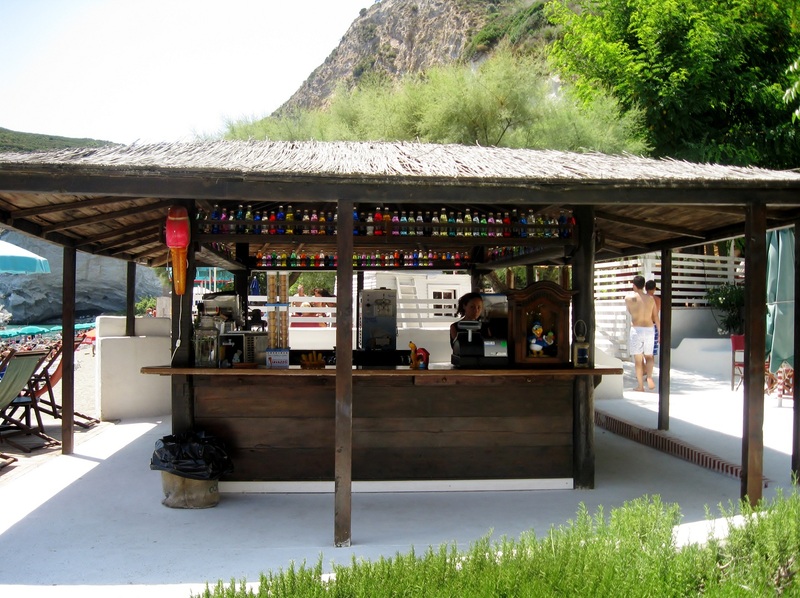 Il Frontone Beach is the hottest spot in Ponza since this is where the Ponza “movida” takes place, specially in the evening, when happy hour begins with the coolest lounge music. This is the main bar area. 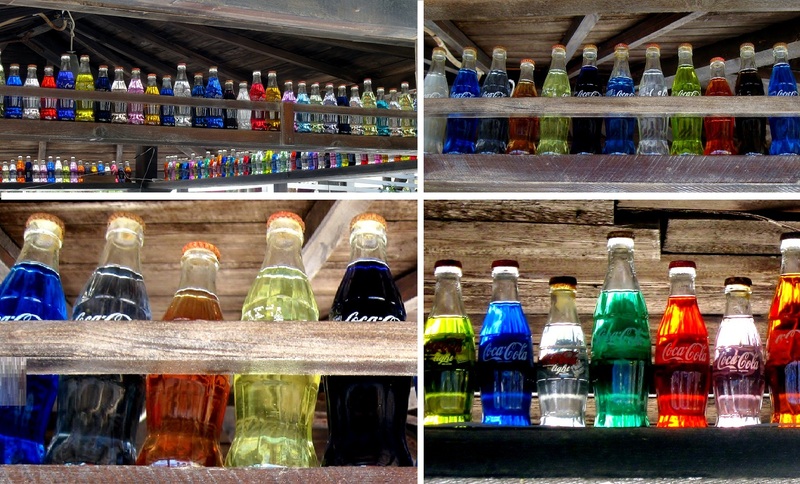 Notice the different colors of coca cola bottles! To better appreciate the marvelous nature of the island, we rented a boat – for 40 euros a day – at the harbour. The next series of pictures need no description for they speak for themselves. que bello lugar este blog te va a salir caro porque ahora me tenes que llevar a estos lugares cuando vaya a Italia ! Just stunning. I love the hotel you stayed in too. It was truly out of this world! Que lugar mas precioso….!! que pintoresco!! Que envidia que lo tenes tan cerca. Es bellisimo tia!! Cuando venga la llevo!!! Such a beautiful place! Thank you for sharing a part of Italy that most tourists never see. Good point! This is why it is really important for me to show non touristy places. 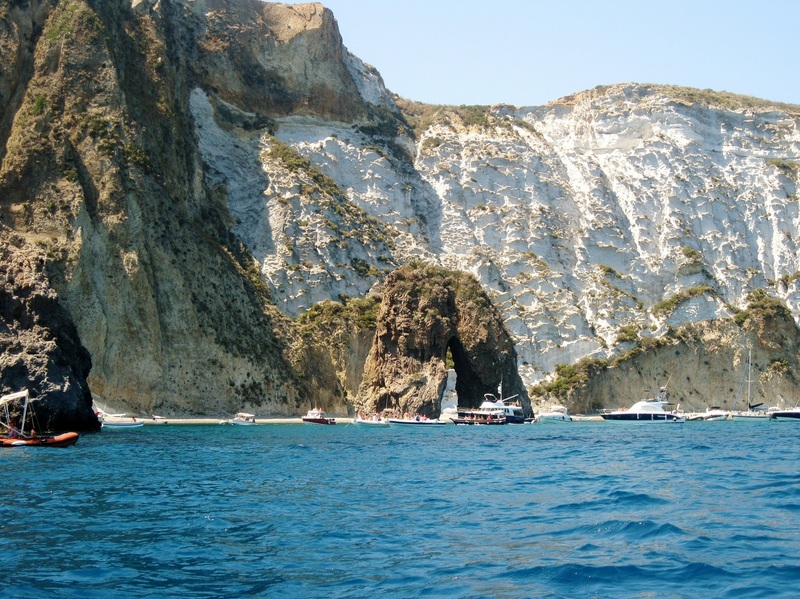 Stunningly beautiful – I love the coloured houses and the cliffs and the view from your hotel and the turquoise water …. Great photos too! 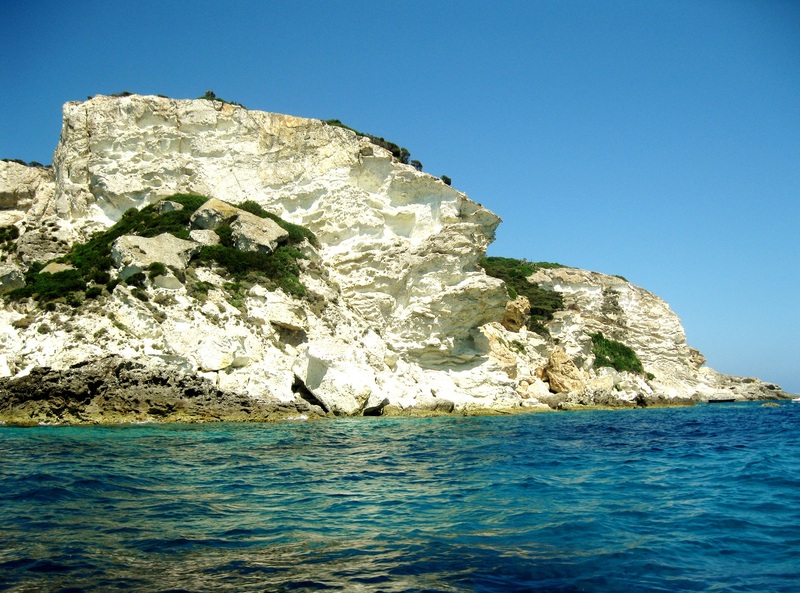 I can never understand why people fly to far off places for their holidays when Europe is so full of amazing locations, What a beautiful island. You said something so wise!! 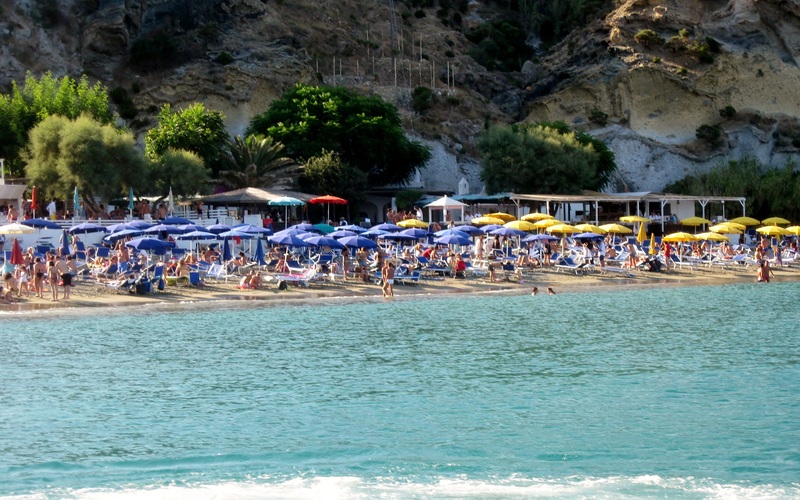 In fact, we always stay in Italy during summer since it has so many beautiful seaside places. 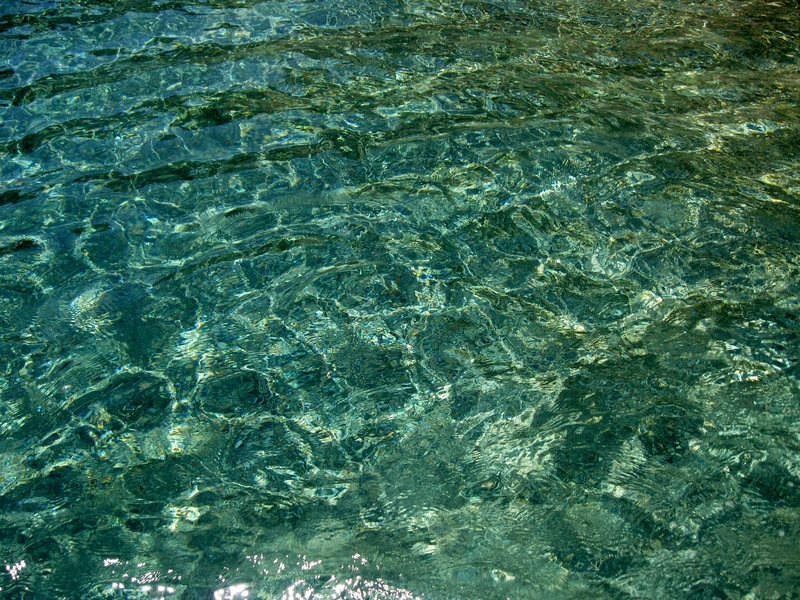 Nothing beats the Mediterranean during summertime!! Stunning – and can´t believe I hadn´t even heard of it! 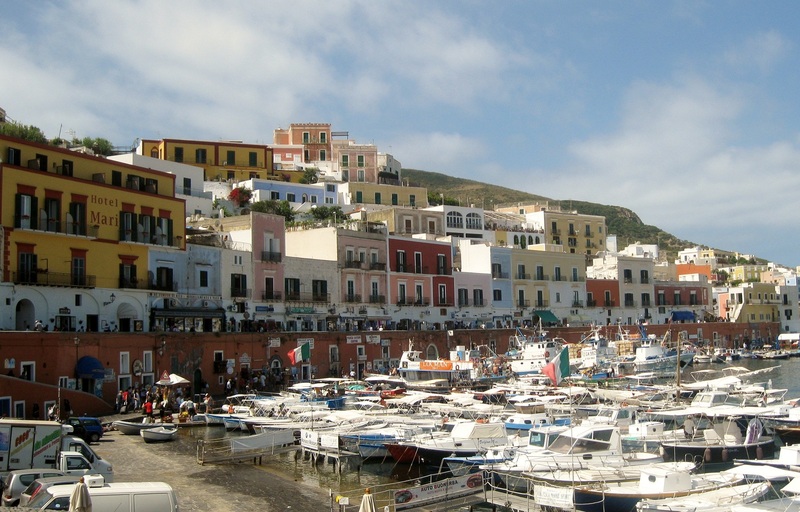 How do you reach Ponza from Roma? Just asking because we might be visiting friends in Anzio later this year! You reach it from Anzio!!!! You just have to take a ferry from there for about 1 hour and 30 minutes. Perfect – want to get planning right now! Great!! 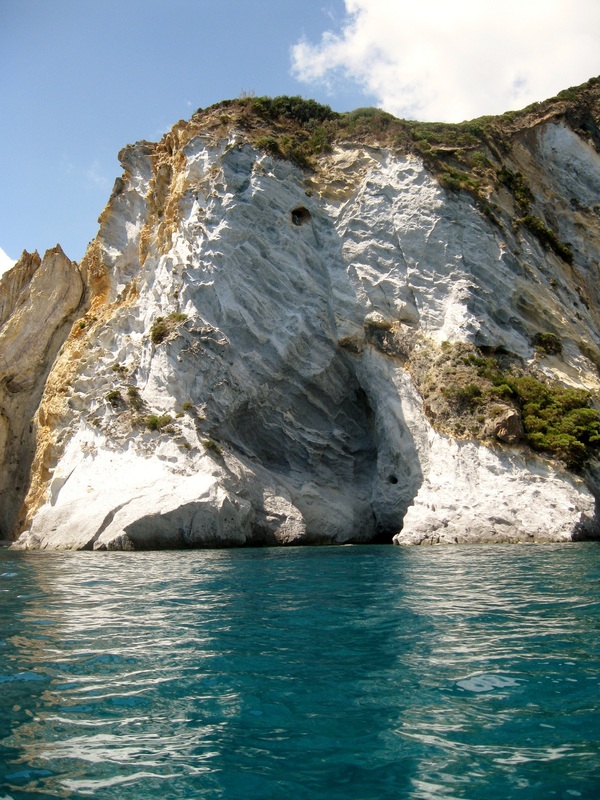 You would love Ponza! My word – this is beautiful! My husband and I are wanting to do a 5 year wedding anniversary trip the year after next, and we are thinking Spain or Italy. 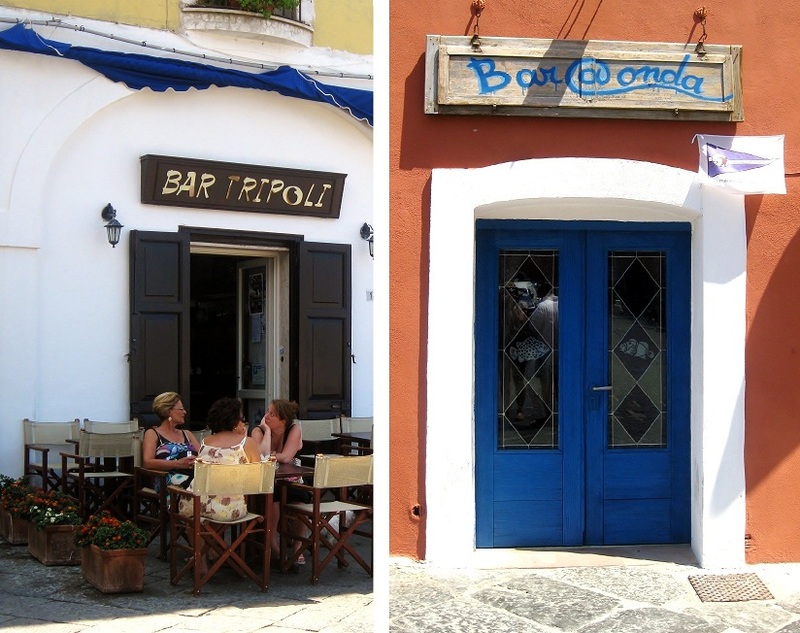 Your blog and this post most certainly sway me to Italy! So amazing! In spite of the fact that I live in Rome, and therefore I am prone to recommending Italy, Spain has also wonderful places. It all depends on what attracts you more!! Thank you for sharing your beautiful photos. Who minds a tiny room when you have those lovely views. I’m sure your holiday was wonderful. You are welcome!! It is my pleasure to have the opportunity to share all these beautiful places with all of you!! what stunning photos, you have made me want to book a holiday this instant. I love the view from your b and b. Thank you for visiting! Indeed, the view from our B&B was stunning. I’m totally in awe of this beautiful country, the breathtaking views, the quaint and colorful buildings. 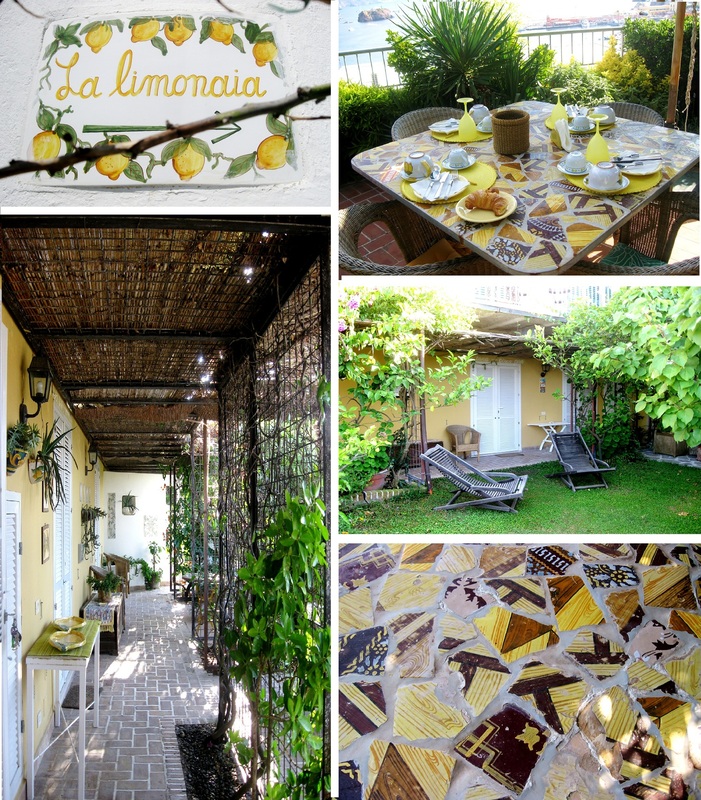 Your bed and breakfast was adorable, lemony yellow against the bluest waters; I could move right in. I so appreciate your sharing this; I feel as tho I’m taking a dream trip right along with you. Thanks for your lovely comment!!! I am glad you are enjoying my posts!! !